How the Sinclair Broadcast Group became a massive propaganda machine; Memphis reporters are fighting for “justice through journalism” to commemorate the 50th anniversary of MLK’s assassination; Trump’s dangerous push to privatize veterans’ healthcare; and how teachers are paying out of pocket for classroom basics like textbooks and pencils. Subscribe to Off-Kilter on iTunes. A video produced by Deadspin’s Timothy Burke, showing dozens of local news anchors saying the exact same words, brought national attention to a series of promotional segments airing on 193 local TV affiliates owned by the Sinclair Broadcast Group, all warning viewers about a torrent of “fake news” promoted by “members of the media [who] use their platforms to push their own personal bias and agenda to control ‘exactly what people think.’” If that message sounds familiar, it’s because it’s echoes Donald Trump’s anti-media talking points to a terrifying tee. Rebecca speaks with Judd Legum, editor in chief of ThinkProgress, about the rise of Sinclair — and its role in driving a rightward tilt of local news across the U.S.
Next, Dr. Martin Luther King, Jr. gave his life fighting for economic and racial justice — yet 50 years later, his call for a living wage remains a dream still to be achieved, with a staggering 40 percent of American workers earning less than $15 an hour. Racial equity remains perhaps an even more distant dream, as huge gaps in income and wealth earned by communities of color persist five decades after Dr. King’s passing. That’s what’s behind the MLK50 “Justice through Journalism” project, a yearlong reporting project on economic justice in Memphis, Tennessee. To kick off a series of conversations commemorating the 50th anniversary of Dr. King’s passing, Rebecca speaks with Wendi Thomas, the project’s founder, editor, and publisher. Later in the show, last week’s shakeup at the Department of Veterans Affairs — in which President Trump showed Secretary David Shulkin the door in favor of a Navy doctor with no known policy views — has brought renewed attention to an already heated debate around privatization of veterans’ health care, with Shulkin claiming he was removed because of his opposition to privatization. Rebecca talks with Iraq war veteran Will Fischer of VoteVets.org, the nation’s largest progressive veterans’ organization, about what’s at stake. And lastly, in a rare bit of good news, a $29 million gift to DonorsChoose.org — a crowdfunding website that funds school and classroom projects mostly in low-income communities — funded all 35,000 teacher requests on the website. The gift made headlines amid the growing movement of teacher strikes demanding higher wages and school funding, which spread this week to Oklahoma, where teachers say they’ll “fight until hell freezes over” if need be to see their demands met. A look at the requests on the DonorsChoose site offers a timely glimpse into how the teacher strikes are about much more than wages. Rebecca talks with DonorsChoose.org’s Katie Vallas, a former Oklahoma teacher herself (who also happens to be Rebecca’s sister) about the massive unmet need in classrooms across the U.S. — and how teachers are paying out of pocket for basics like pencils and textbooks. REBECCA VALLAS (HOST): Welcome to Off Kilter, the show about poverty, inequality and everything they intersect with powered by the Center for American Progress Action Fund. I’m Rebecca Vallas. This week on Off Kilter, I talk with Judd Legum, editor-in-chief of ThinkProgress about the rise of the Sinclair Broadcast Group and how it came to control a massive propaganda machine of 193 local TV affiliates. Next, to kick off a series of conversations commemorating the 50th anniversary of Dr. Martin Luther King Jr.’s assassination in Memphis, TN, I speak with Wendi Thomas the founder of the MLK 50 Justice through Journalism project, a year long reporting project focused on the fight for a living wage and other yet to be fulfilled dreams of Dr. King’s 50 years later. Later in the show Donald Trump is so hell-bent on privatizing veteran’s healthcare he ousted a VA secretary who stood in the way of that agenda. I talk with Will Fischer of VetVets.org and a Iraq war veteran himself. Sorry Marin Kirk, no ‘In Case You Missed it’ this week, Jeremy Slevin is off for vacation but he’ll be back next week so there will be plenty of opportunities for me to rag all over him. And lastly in a rare bit of good news a massive $29 million gift to DonorsChoose.org, a crowdfunding website that funds school and classroom projects mostly in low income communities funded all 35,000 teacher requests on the website, making headlines as teacher’s strikes in red states such as Oklahoma continue to shine a spotlight on the growing movement to boost teacher pay and school funding. I talk with DonorsChoose’s Katie Vallas, a former Oklahoma teacher herself who also happens to be my sister about how teachers are paying out of pocket for basics like pencils and textbooks. Don’t go away, more Off Kilter after the break, I’m Rebecca Vallas. You’re listening to Off Kilter, I’m Rebecca Vallas. You’re listening to Off Kilter, I’m Rebecca Vallas. That was a clip from a video that went viral last week produced by Deadspin’s Timothy Burke. The video, which shows dozens of local news anchors saying the exact same words brought national attention to a series of promotional segments airing on 193 local TV affiliates owned by the Sinclair Broadcast Group, all warning views about a torrent of quote, “fake news” promoted by quote, “members of the media who use their platforms to push their own personal bias and agenda to control exactly what people think.” If that message sounds familiar it’s because it echoes Donald Trump’s anti-media talking points to a terrifying ‘T’. With me to unpack what’s behind the rise of the Sinclair Broadcast Group and it’s role in driving a right-ward tilt of local news across the US, I’m joined by Judd Legum, he’s the editor in chief of ThinkProgress. Judd, thanks so much for coming back on the show. JUDD LEGUM: Thanks for having me. 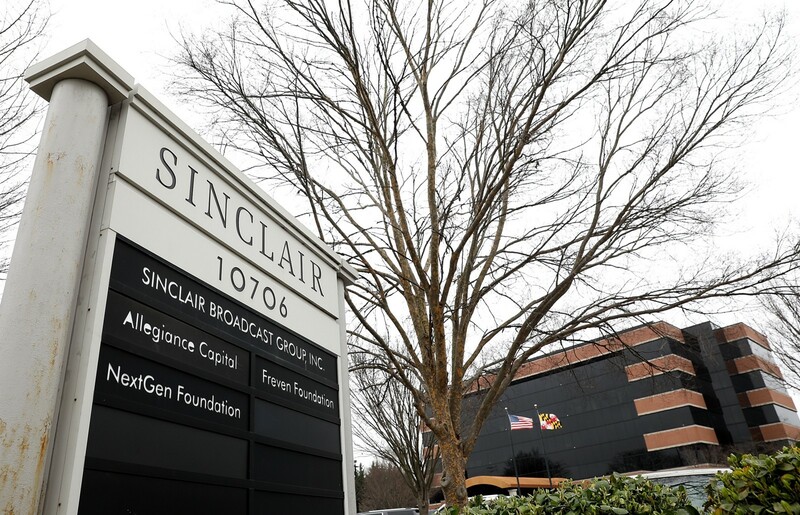 VALLAS: So the Sinclair Broadcast Group became a household name this week, everyone is talking about them. But they’re not new to the scene. What’s the story behind Sinclair and how they came to be? LEGUM: They’re a company that for many years has been buying up local affiliates, ABC affiliates, NBC affiliates, CBS affiliates and they take over the whole station including the local news broadcasts. And what’s happened is for many years they have inserted into the local news they’re own political beliefs which tilt fairly strongly to the right. This first became a controversial issue in 2004 when they required all of their affiliates to run a documentary about John Kerry and his history with the Swiftboats, which was basically the entire right wing smear of John Kerry. There wasn’t much to it, there weren’t many facts behind it but Sinclair was able to get that out to a lot of people. Since that time, they’ve grown exponentially and now Sinclair affiliates reach 40% of the population in many of the biggest markets in the United States. VALLAS: And part of what’s notable here is we’re talking about local news stations that are reaching, as you said 40% of Americans but this isn’t people tuning into Fox News for example expecting to get right leaning news, these are local stations that have been around for a long time and that people have become accustomed to turning to for news and things that matter in their area. LEGUM: Right, so they’ve developed the trust and the relationship, not really a relationship but you sort of feel a relationship from people who you see everyday on TV if you’re one of the people who likes to tune into news in the morning or whenever the local broadcasts come on and then all of a sudden it can switch and in addition to the local news and the weather and the things that you’re hearing about, there is a lot of national news that they require these stations to run and all of a sudden interspersed into your weather report, into what’s happening with your local school board or what’s happening with different local issues you’re getting a very right leaning take on whatever the big national issues are and the stations don’t have a choice to run them. That decision is taken out of local control and it’s just pushed out nationally. You saw it with this message that was in the Deadspin video but it happens all the time. It’s not always that the local people are being required to read it, they have national correspondents and they’re just required to run the tape. VALLAS: Now, some people listening might be wondering, yeah who really watches local news, maybe these stations are technically reaching 40% of Americans but do people really watch local news and is that what they’re going to to get their news and information. But actually when you look at the data a lot of folks really are relying on local TV for their news. LEGUM: Millions of people still watch television, they still watch local news, it can be something that is on in the background but that people pay attention and still, local news, the national broadcasts, these broadcast networks still bring in the highest audiences so the reach is fairly substantial especially when it’s aggregated and a lot of times what happens is they might, Sinclair might not just own one of the local broadcast networks, they may own all three in a particular network. They may own several affiliates in a particular broadcast area and that can expand their reach even further. VALLAS: There’s been a lot of discussion about the decline of cable news and how fewer people are turning to cable news broadcasts to get their news. But notable to throw a couple of statistics in here that 37% of Americans report that they frequently rely on local TV to get their news which has not edged out by almost 10% the 28% who say that they’re watching cable news and the 26% who are watching national nightly news, so really an important and crafty backdoor that they’ve found here into getting into people’s homes and telling them what to think. LEGUM: And it’s also about which audience is persuadable meaning that the folks who are tuning into Fox News for the most part are probably already fairly dug in in their beliefs and maybe if you’re tuning into Rachel Maddow you may be inclined to match with her political leanings but the local news is going to be hitting a lot of people who are maybe less intensely engaged in politics, probably not tuning into get principally to get any kind of political news or national information and could be persuadable so it’s pretty significant and the Trump campaign recognized that and actually this was reported shortly after the campaign struck a deal with all of the Sinclair affiliates that they would provide access to the candidate and top campaign officials in exchange for an agreement that essentially their answers would run with no analysis or commentary at all, effectively just turning into a campaign ad, whatever they wanted to say got broadcast in exchange for the access. VALLAS: Something you can’t even credibly call journalism in any mood you might be in. LEGUM: Right, there was no, generally it’s the journalist who would be in charge, who would decide what is said and also would fact-check, would put into context, that’s really where the value comes in versus just watching a campaign ad but these were effectively campaign ads and even the questions that were asked, there was reporting on this and you can watch them, were very friendly questions. So they played a pretty important role in getting Trump’s message out in key places like Ohio and elsewhere during the last election and now they’re bigger and will have a great impact on this next election. So it’s a fairly significant thing that’s going on that has gotten attention from time to time over the years but I think most people probably still don’t know when they’re tuning in who owns an affiliate. There’s no public branding or anything like that. VALLAS: Now a few local stations have refused to run this propaganda sounding ad for fake news and Trump talking points and have made headlines in refusing to run these messages. But one thing that a lot of folks might be wondering is reporters who didn’t get into the news business to read talking points that were handed to them and that they may actually directly disagree with, why are they agreeing to do this and why aren’t we seeing them just quit? LEGUM: Well there’s a lot of reasons for that. One is it’s very hard to quit a job if you have a family or obligations, you need a paycheck and local news isn’t a growth business right now. There isn’t necessarily a lot of places to turn to but it’s more than that because Sinclair has all of its employees sign a contract whereby it’s for a number of years and if they were to leave early they would essentially be liable to pay back a certain percentage of the money that they’ve received, sometimes 40% and it can amount to several thousands dollars that people may not have in addition to not being able to afford losing their job. So it becomes very difficult and you have to remember that this is a company that goes and acquires affiliates so you could be working there, this may have been your job for 5, 10, 15 years. This is your whole professional life and all of a sudden it gets bought up be this corporation holding firm and all of the rules change. It’s difficult to say oh I’m just going to immediate leave and do something else, what it is I don’t know. It’s not like there’s a lot of local papers to go to, there’s not necessarily a lot of options for folks. VALLAS: So you’ve actually been reporting a story talking to former Sinclair employees who have been privy to a lot of the strategies behind what we’re not watching play out very publically. What are you hearing from former Sinclair folks? LEGUM: I’ve talked to a few people so far. I’m working on a story and they have a number of frustrations. I think part of what they do is really cut costs as you mentioned, it’s not really a play to increase viewership but I think they are aggressively cutting costs by eliminating positions. So people who maybe are the anchors are also having to do some of the editing and be their own producer and do all of that because they’ve cut a lot of the support positions. Then they have these must run segments that are foisted upon them on a daily basis and I think there was, I’ve heard about a lot of efforts to try to bury those at certain times when they felt a lot of people wouldn’t be watching. Maybe at 5 am if that’s when the news broadcast started, do it right at the beginning at 5 am because most people are not up by then to try to diminish the impact of this on their viewers. And I think also just the feeling that their own news judgment and their own relationship with the viewers isn’t really being respected is something that’s come up quite a bit. So a lot of the people I’ve talked to are formers and people who have left and they’re citing the heavy hand of Sinclair in this. And I’ve also heard in addition to the on air stuff obviously there’s websites, things of that nature and burying stories that might be critical of Trump or about the Russia investigation, burying those lower down on the page and being forced to push those down where less people are going to see them. VALLAS: Now this conversation becomes even more timely given not just the revelations through the Deadspin and other important reporting that’s happened over the course of the past several weeks but because of the fact that the Sinclair Broadcast Group is set to become even more of a behemoth with a planned acquisition, a planned $3.9 billion acquisition of Tribune Media which would add another 42 stations to their already 193 existing affiliates and this is where some of the politics come in and Trump appears back on the scene in thinking about some of them issues at play here in that the deal has to secure approval from the Justice Department and from the FCC, the Federal Communications Commission and that’s something that Trump has a real interest in allowing to go forward it would appear. LEGUM: Yeah, and the FCC has already taken steps to relax their rules around ownership that will make this more likely to be approved and I think the overall construct of the FCC already looks very favorable for Sinclair so yes if you accept the idea and I think there is a lot of evidence to do so that Sinclair is quite a powerful force in pushing these right wing narratives on a lot of people most of whom are unsuspecting, that this problem is likely to get worse and when you think about what the strategy for the Trump reelection campaign would be in 2020, it was already their strategy in 2016 it’s to go around the national media and to try to get to either people directly via Facebook and elsewhere or go through what they perceive as much more friendly and also much more targeted media in key areas and Sinclair will be able to help them facilitate a lot of that. VALLAS: If this deal does go through what should we be watching for and what is the future of media, not just local news but in that sort of a precedent setting move what can we expect news to become in the era of Trump? LEGUM: Well I think it’s somewhat disturbing to think about it if you think about this going forward unchecked. Each acquisition gives them more cash flow and the ability to eat up more stations and more affiliates. I do think you’re starting to see some backlash. One of the key sources of income on a cyclical basis on local stations is political advertising and they have been a few democratic candidates who said we’re not going to advertise anymore on Sinclair stations because we don’t feel like our donors would want to support that. That could cause a problem for that eventually. Right now it’s just a handful of candidates but if that caught on that could be a problem. So there may be some bumps along the road for them but right now they’re doing pretty well. VALLAS: For people who want to get involved and who are looking for ways to be a part of that backlash is there anything that people who care about the integrity of journalism can do in this moment? LEGUM: Well I think you can write to the FCC and let your views be known about what you think about this acquisition. So that’s certainly something and presumably they will look at the comments. VALLAS: Presumably with a little bit of a smirk on your face, one would hope. LEGUM: But that is something that’s part of the formal process here. And then of course, there’s just generally who’s in control of the government and who’s going to be setting the rules. I mean right now you have folks who are setting the rules who want the facilitate this, Trump has been pretty public in the last couple of days praising Sinclair, sounds like he’d be all for them gaining more stations. Until you have a change of political leadership, I don’t think on the aggregate level much is going to change. VALLAS: I’ve been speaking with Judd Legum, editor-in-chief of ThinkProgress, you can follow him on Twitter @JuddLegum. Thanks for coming back on the show, Judd and for everything you do to throw snark and more at folks who are doing what we’re talking about. LEGUM: Well thanks a lot, Rebecca. VALLAS: Don’t go away, more Off Kilter after the break, I’m Rebecca Vallas. My name is Gracia Martinez Rosas. Hi, I’m United States Senator Cory Booker. My name is Ken Morris and I’m the great, great, great grandson of Frederick Douglass and I’m also the great, great, great grandson of Booker T. Washington. Since Dr. King was assassinated 50 years ago many things have changed and many things have stayed the same. We have much to be proud of, great advancements and achievements towards justice and equality in this nation. We now have Black people in positions of power, whether that be as elected officials or other types of decision makers. But the truth is every generation must continue to work to preserve and advance freedoms and rights. Certain countries are being demeaned; whole communities of Americans are being degraded. We are now faced with an administration in Washington that has shown it’s hostility to civil rights at every turn. This past year we saw people playing politics with the lives of our young Dreamers. We see mass incarceration, something that wasn’t around during the time of King, now we have more African-Americans under criminal supervision than all the slaves in 1865. When others are trying to convince us that we have nothing in common are the exact moments when we must embraces our commonality the most. King and many others who came before us overcame seemingly insurmountable obstacles and they did not turn away from big challenges. It was a determination of the students who sat at the lunch counter in Greensboro and of the brave citizens who marched in Selma. Dr. King said that the fight for equality must be fought on many fronts. Youth are coming together and they’re building a new message for the future of our society that isn’t about division. They are the next generation of leaders and our kids are the ones that are going to solve these issues. Undocumented young people and people of color are ready, we are ready to organize and we are ready to win. We have much to do to prove worthy of King’s dream and to make the dream more of a reality in today’s day and age. It wasn’t just for African-Americans, it was for all Americans. We call for a revival of our democracy in this country and a revival of the dream of Dr. King. The injustice of anyone is a threat to just for everything. So let’s fight together knowing that our diversity is our strength and our unity is our power. VALLAS: You’re listening to Off Kilter, I’m Rebecca Vallas. This week marks the 50th anniversary of Dr. Martin Luther King’s assassination on the balcony of the Lorraine Motel in Memphis, TN. Dr. King gave his life fighting for economic and racial justice yet 50 years later his call for a living wage remains a dream still to be achieved with a staggering 40% of American workers earning less than $15 an hour today. And racial equity remains perhaps an even more distant dream as huge gaps in income and wealth earned by communities of color persist five decades after Dr. King’s passing. That’s what behind the MLK 50 Justice Through Journalism project, a year long reporting project on economic justice in Memphis, TN. Joining me by phone is the project’s founder, editor and publisher Wendi Thomas, she’s also a senior writing fellow at the Center for Community Change. Wendi, thanks so much for joining the show. WENDI THOMAS: Thank you for having me. VALLAS: Just to kick things off, tell me a little bit about the project and the story behind it’s founding. THOMAS: So this project was founded out of, I guess it’s initial origins were out of a writing project I was doing at The Commercial Appeal when I was a Metro columnist there. I was covering the 40th anniversary of Dr. King’s assassination and I was thinking even then what would we do to mark the 50th anniversary. And so I’ve been ruminating on this for about ten years, what would it look like to honor the dreamer in Memphis? If you know anything about King’s legacy you know that that means you better really reckon with jobs and wages because that’s why King was in Memphis. It was for underpaid public employees who wanted higher wages and the right to a union. So many of those issues are so relavent still today that my team has had no shortage of stories to write and things to cover. VALLAS: Now you’ve brought together a whole team of journalists who have been writing for a year on issues such as a living wage, black businesses in Memphis, power and wealth, these are all major themes for the project. Why commemorate Dr. King’s legacy and the anniversary of his passing through journalism and what does journalism have to do with justice? THOMAS: I think King spoke truth to power, a lot of the things he said was controversial, some of the parts we don’t remember, his opposition to the Vietnam war, definitely his critic of capitalism and I think good journalism also speaks truth to power, at least the kind of journalism that I’m interested in doing. And I think while there’s notion that journalism is completely impartial and doesn’t take sides, I think there are some things we can take sides on, I think we can take sides and say yes this is good for everyone, all children to have an education, right? That shouldn’t be a controversial political position, and similarly I don’t think it’s controversial to say that all workers should make enough to live on. If you work full time you should make enough to make your ends meet. I think journalism to the extent that we can help eliminate the systems and structures that keep that from happening, that keep poor people poor then there is a role for justice in journalism. VALLAS: Did you launch the project on it’s own and as it’s own separate entity because you didn’t feel that these stories were being told adequately in mainstream media? THOMAS: Yeah well after I left the daily paper here in Memphis I went and did a fellowship at Harvard at the Nieman Foundation. That’s where I incubated this project and figured out exactly how it’s going to work. And I don’t think that you would find this kind of journalism in most mainstream news publications because it is very critical of the status quo and status quo, those are advertisers and those are readers so they’re not used to having their perspectives challenged [INAUDIBLE] having their practices challenged. That’s all new for them and I don’t think traditional mainstream news outlets would want to rile up their advertisers like that, they’re trying to keep them happy which unfortunately has the side effect of reinforcing the status quo which is to keep poor people poor. VALLAS: I mentioned that a living wage is a big part of what this project has looked at and that’s actually something that has real significance in Memphis in particular. As part of this project your team conducted a living wage survey of Memphis employers. What did you find in that survey? THOMAS: Yeah, so we took a look at the 25 largest area employers who collectively represent about 160,000 employees and what we found was that most companies don’t want to say how much they pay their workers. And so I talked to an economist about that, so what can you conclude if a company doesn’t want to tell you how much they pay their workers, whether they pay their workers a living wage? And the answer was they’re hiding something. if companies have good news to report they’re glad to share that. We were actually surprised to find that the city of Memphis government, Shelby county government and also Shelby county schools all do pay their workers fairly well, I mean we’re not talking $20 an hour but we’re talking 85% more than $15 an hour. And the Shelby county schools have recently made a commitment to pay of it’s workers $15 an hour and so that’s a good thing. But when you get into other employers, say private employers like FedEx which is headquartered here and employs 30,000 people, FedEx doesn’t want to say. They answered some of our questions but when press for more information about benefits and do they use temp workers or do they outsource work, they sent us a statement about how much money they give to charity events. And charity isn’t justice. VALLAS: A lot of the stories that you guys have focused on in this project are really focused on Memphis in particular and they really put a face on the fight for a living wage. I’d love if you would tell some of the stories that your reporters have been telling through this project. THOMAS: Let’s see, gosh, where would I start? So we have written a series of stories about companies that pay their workers enough to live on and unfortunately it’s not a long list of companies and they tell to be really small, maybe non-profits or family owned businesses to show that it is possible, you can have these discussion within your organization. We ran a story about a woman that works at a company that she started making $15 an hour and now she’s able to afford a home. And so these wages aren’t just so you can get your hair done or your nails done, it’s so you can have some kind of stability for you and for your family. So those stories are always fun to tell. We did a story about hotel housekeepers. And what it’s like to work as one where you’re having to do more work with less. One of the hotel housekeepers told us that she has to bring her own cleaning supplies because they don’t supply her with those. And even right now around the anniversary you might hear the helicopter overhead, I’m one street over from the Civil Rights Museum. But you even have some stories on the stories on the site in the last couple of days about how this anniversary commemoration is really not for the people who live right around the museum. So if you just walk a block over from the Civil Rights Museum where, Lorraine Motel where King was killed you walk just a block over and it’s just abject poverty and people who feel like this commemoration is not for them. The signature event tonight is going to be $100 a plate gala, you’d have to work 14 hours if you make minimum wage to afford a ticket. And so there’s this tension between honoring this man who came here about labor and then also respecting the labor that’s still here today. VALLAS: How do you think that Dr. King would want us to be commemorating his legacy and the anniversary of his passing 50 years later? THOMAS: Yeah, I don’t think he would give two wits about, what would be the nice way of saying it. I don’t think he would care about these galas and these celebrations and these big shindigs with lots of people pontificating. I would like to think he’d be out here in the streets with the protestors and the activists. We have about 8 I think protesters that were outside the jail yesterday that got arrested, dragged on the street by police, cuffed in plastic zip ties, I think to think he would be with them today were he alive. I think he would be disappointed to know that Memphis is the fourth largest metro in the nation and he would be certainly sad to know that 52% of the black children here live below the poverty line. But that’s what we’ve got and the question we need to answer is the question posed by King’s last book which is where do we go from here? VALLAS: Where can folks go to learn more about the MLK 50 project and what do you have planned for the days ahead? THOMAS: So you can go to MLK50.com and follow us on twitter @MLK50Memphis and we’re also on Facebook at MLK50Memphis. And we’re just going to continue to centralize workers and low wage issues [INAUDIBLE] and the project is actually going to sunset or the plan is for it to sunset when the strike was settled which they were able to attain. And we’ll find another way to keep challenging the status quo. VALLAS: I’ve been speaking with Wendi Thomas, she’s the founder, editor and publisher of MLK 50 Justice through Journalism, a year-long reporting project on economic justice in Memphis, Tennessee. She’s also a senior writing fellow at the Center for Community Change. Wendi thank you so much for this project and for taking the time to join the show. THOMAS: Absolutely, thank you for having me. You’re listening to Off Kilter, I’m Rebecca Vallas. Last week’s shakeup at the Department of Veteran’s Affairs in which President Trump showed Secretary David Shulkin the door via a tweet in favor of a Navy doctor with no known policy views has brought renewed attention to an already heated debate around privatization of veteran’s benefits with Secretary Shulkin claiming he was removed because of his opposition to privatization which President Trump he claims supports. With me to discuss is Will Fischer, he’s the director of government relations at VoteVets, the nation’s largest progressive veteran’s organization and an Iraq war veteran himself. Will, thanks for coming back on the show. WILL FISCHER: Thank you so much for having me today, Rebecca. VALLAS: So Will, what the heck happened last week? FISCHER: Yeah, make no mistake about, the ouster of David Shulkin came as a result of a coordinated campaign being led by the Concerned Veterans for America which are a Koch Brothers front group and others who are part of the pro-privatization crowd inside the White House and the Department of Veterans Affairs who did not believe that David Shulkin was being aggressive enough in his efforts to bring about the privatization of the Department of Veterans Affairs. VALLAS: Now the folks who are in favor of privatizing veteran’s benefits and more often use language like choice. This is about veterans’ choice. But that’s not what this is really about. What are Trump and his supporters in this case looking to do when it comes to veterans’ benefits and what does privatization really mean in this context? FISCHER: Privatization is a fancy way of saying we want to take money out of the pockets of veterans and put them into the pockets of millionaire and billionaire hospital executives. Take resources and funds out of the VA and put them into a for-profit privatized system. At the same time I would add that the mitochondria of this campaign is making money, it’s profits. And those who support privatization they know that if they can destroy and privatize the VA they can take resources meant for the 9 million veterans who are currently enrolled in the VA health system and they can take billions of dollars set aside for those veterans and move it into as I said earlier the pockets of millionaire and billionaire hospital executives. And I will add that while this is all going on you have at the same time the arrival of John Bolton into the White House. You have the possibility of a Secretary of State Mike Pompeo and if that happen, if Donald Trump is able to bring about his war cabinet and build out the chorus for war we’re in a position where there may be a whole lot more veterans because these people certainly are not resistant at all, speaking of their desire to send people to war in Iran, North Korea and every place in between. I would also add that there is an ideological piece to this debate and those who are the opponents of Medicare for All, they recognize that the VA is popular among the people who use it. The VA, it works well and the VA, it’s also a government run single provider health care system and those who are the opponents of Medicare for All or single payer health care they know that if they can kill the VA they can really dash the hopes of there ever being universal health care realized in this country. FISCHER: For a guy who really has built up his brand through firing people, Donald Trump seems to take, find refuge in firing people via tweet which is rather cowardly if you ask me. VALLAS: I can’t disagree and he does seem to love Twitter as his preferred medium, I guess it’s easier to communicate that way when you’re sitting watching Fox News, you’re able to multitask and remove the obstacles in the way of your agenda in the form of cabinet secretaries who don’t agree with you. In this case Dr. Shulkin took to the New York Times in a widely read op-ed and then took to the airwaves in a number of news interviews. To share his views and his concerns with privatization in particular of veterans’ healthcare benefits and to explain why it wouldn’t work, help me get a little bit more concrete in why privatizing veterans’ healthcare isn’t going to work for them. FISCHER: So privatized health care equals worse health care for veterans. The VA is uniquely designed in the fact that it is set up to meet the needs of veterans and to take care of the whole veteran. It is the largest integrated health care system in this country and the VA is a world class health care providers especially a leading institution in terms of issues related to people who have lost arms or legs or people who are suffering from post traumatic stress or who have suffered a traumatic brain injury or spinal chord injury, so on and so forth. And when you have a system like the VA that again takes care of the whole veteran, you can go into the VA and there is a level of expertise and knowledge among the people who work there to know to look for issues that are effecting veterans and military families that people in the private sector just don’t have any knowledge to look for. To piggyback a bit on that I would point to some hard statistics for you; between 2000 and 2010, suicide rates among veterans who were not enrolled in the VA health care system increased by 40%. During that exact same amount of time veterans who were enrolled in the VA health care system saw their suicide rate decrease by 20%. There have also have been studies shown that veterans who were sent to the for-profit health care system are more likely to develop dependency on opioids rather than veterans who are inside the VA health care system. VALLAS: Now one veterans group seems to disagree with the rest, you guys are, VoteVets are vocally opposed to privatization it seems that most every major veterans group is in the same place that you are. But then there’s Concerned Veterans for America, which is an advocacy group funded by the billionaire conservative brothers, the Koch brothers, Charles and David Koch and their allies and they are vocally supportive of privatizing veterans benefits. Tell a little bit of that story. FISCHER: So Concerned Veterans for America, CVA, they are a Koch Brothers front group and what their mission is to have somebody leading the VA who would go about bulldozing and taking a wrecking ball to VA facilities within a few hours of their senate confirmation. So whether you’re talking about their former leader who is now a host on Fox and Friends, Pete Hegseth, his name was being floated to manage, to take over leading the Department of Veterans Affairs which as I’ve said would be like naming Colonel Sanders to the board of PETA, it’s just ridiculous. To their current efforts to set up some type of brat commission to get VA facilities shut down, and their never ending quest to expand the choice program, draining the VA of resources and inevitably denying veterans a choice we want to make which is to go to our VA.
VALLAS: So what do we know about Secretary Shulkin’s replacement? He’s a Navy doctor and admiral, his name is Admiral Jackson. What do we expect from him, it’s been widely reported that he has no known policy views so is there anything to expect from him at all and do we think that that’s part of what’s going on here is that Trump has put in someone who is just going to play ball and support this agenda without brining any of his own views or concerns into the mix? FISCHER: First, Dr. Jackson has not replaced Secretary Shulkin yet as Dr. Jackson has only been nominated and I have to say when the news first broke that he had been nominated my first response was ‘who?’ And I think that was a lot of people and then of course I crawled into the attics of memory and was brought back to that image of him standing before the White House Press Corps describing Donald Trump as a perfect specimen of health and saying he had lived to be 200 years old and so on and so forth. But where does he stand on privatization? No one knows, Rebecca your guess is as good as mine so what we’re doing right now is through lifting up the voices of our members all across this country and working with elected officials we’re working to press Dr. Jackson on where he stands on these issues and will he come out and categorically say he is opposed to efforts to privatize our VA. At the same time I have to wonder what experience does he have to lead anyone to believe that he is prepared to take on what some describe as the hardest job in Washington, DC. And it’s ridiculous to say he’s a doctor he’s the best person to lead the VA. The same could be said if a mortician was nominated because the VA overseas all the federal managed veterans cemeteries or a college administrator would be because it overseas the G.I. Bill. There are a lot of parts to the VA, there are a lot of mid-size cities who their mayors have fewer constituencies than the VA has employees. You are talking about the second largest agency in the federal government, over 330,000 employees, a budget of over $250 billion, over 1,000 facilities and a lot of moving parts and besides describing Donald Trump as a picture of health I’m not sure what Dr. Jackson has in his background that leads anyone to believe that he’s prepared to take on this job. VALLAS: What should we be looking for in the weeks ahead as this nomination battle rages on and as questions are asked around privatization and whether Admiral Jackson supports it? FISCHER: For Admiral Jackson to come out and say whether he stands with veterans or if he stands with the Koch brothers and their puppets on Capitol Hill who are part of the pro-privatization crowd. VALLAS: Well Will we’ll need to have you back in the weeks ahead as we all watch for that and wonder where things are going to be heading at the VA with so much on the line. I’ve been speaking with Will Fischer, he’s the director of government relations at VoteVets, it’s the nation’s largest progressive veterans organization. He’s also an Iraq war veteran and you can follow him on twitter at, I’m going to get this wrong will! FISCHER: @will_c_fischer, if you just type in Will Fischer it should pop up. VALLAS: You make it so hard. @will_c_fischer that also has a ‘c’ in it too. Will Fischer, thanks so much for coming back on the show. FISCHER: Thank you so much for having me on Rebecca. VALLAS: And for what you’re doing to protect veteran’s care. Don’t go away, more Off Kilter after the break, I’m Rebecca Vallas. You’re listening to Off Kilter, I’m Rebecca Vallas. Last week brought some rare good news for a change in the form of a massive $29 million gift to DonorsChoose.org, a crowdfunding website that funds school and classroom projects mostly in low income communities. The record setting gift which funded everyone of the 35,000 teacher requests on the Donors Choose site made healthlines amid the growing movement of teacher strikes demanding higher wages and school funding, which spread this week to Oklahoma where teachers say they’ll fight until hell freezes over if need be to see their demands met. A look at the requests on the Donors Choose site offer a timely glimpse of what’s going on in classroom across the U.S. and how the teachers strikes are about much more than wages. To tell the amazing story about the Donors Choose gift and what we can learn from the organization’s work to get teachers and students what they need in the classroom, I’m joined by Katie Vallas, she’s the school and partnership engagement manager at DonorsChoose.org and a former Oklahoma teacher and as may have guessed, she also happens to be my sister. Katie, thank you so much for joining the show. KATIE VALLAS: Yeah, long time listener, first time caller, love the show. REBECCA VALLAS: I knew you were going to say that. Well l have to say it’s a pleasure to have you on the show and it’s something I’ve wanted to do for a long time but I only am OK with this if you promise not to say anything embarrassing about me. KATIE VALLAS: Oh man, now I have to change my talking points. REBECCA VALLAS: Well change ’em up quick, so Kat, tell me about this gift, what’s the story behind how Donors Choose came to get $29 million to fund all of the requests on the site? KATIE VALLAS: Right, so the story of this actually goes all the way back to 2014, Stephen Colbert donated enough to be able to support every single teachers project in his home state of South Carolina. And that was groundbreaking that was the first time that had ever happened. And we have lots of individual donors who have supported projects that really spoke to them, we’ve had lots of people, companies, foundations who had supported a whole host of projects that all spoke to something they were really passionate about. So science projects or supporting Pre-K projects or something like that. But this was the first time that someone had said you teacher, every single teacher in South Carolina I care about you and no matter what you need I’m going to pay for all of it. So that you don’t have to pay for out of pocket for what your kids need today. And so when that happened a lot of people took notice. A year later we saw that what Stephen Colbert had done had become a new trend so several dozen athletes, entrepreneurs, actors, all did the same thing. So Serena Williams adopted her state and paid for every single teachers request there at the same day that Ashton Kutcher did the same thing with his state, the same day that Biz Stone did the same for his. And then so it was this powerful moment that we started calling the best school day, so every single teacher across the country getting to feel like there is someone who cared about them. But what we realized was that as much as many teachers had felt the love on that day, there were some areas where there hadn’t been that one person who really stood up for them. There were a few states where someone hadn’t said, you Michigan, I care about you today. And so a year later our founder Charles, went to a company with a pretty bold request and he said, Ripple, a crypto currency company that had never previously donated to our site, he said Ripple if you donate $29 million you will have made it possible for every single teacher in the country to feel support. Every single teacher who is using Donors Choose, I should say. And they said yes, which was pretty, talking about a pretty bold request. I think he included in his email I’m swinging for the fences here but I know a million students would want me to ask. And so the fact that it actually came through was a really powerful moment for teachers. REBECCA VALLAS: So for folks who aren’t familiar with Donors Choose I’m going to jump in and ask you to share what’s the story behind the organization? KATIE VALLAS: Yeah so the story there is we were founded in New York in the year 2000 by a social studies teacher in the Bronx. It was 5 AM in the morning and he was photocopying copies of the books he was reading with his students and he was realizing as he was printing off page after page after page because there weren’t enough copies for every student to have their own copy, he realized that if people knew that this was what teachers are doing they would want to be able to help, they would want to be able to support it. So he started it off small, he created a website, this was 2000 so basically right, it was like a GeoCities crazy, a MySpace page, putting forward if you want to help support my classroom these are the things I need and he did the same thing for his coworkers and then from there, from his school it moved on to a few schools in the Bronx and then from there it moved to be New York City. And now, 18 years later we’re used by 75% of the public schools in the country and teachers go to us who have very similar experiences to Charles our founder who was saying if people knew I was paying out of pocket for this they’d want to help so that’s how we started. REBECCA VALLAS: and actually part of the story there is that he even had his own students working on the project when it was getting launched. KATIE VALLAS: Oh yeah, so much of the jobs now that are held by my colleagues were originally held by 16 year old students so my work for engaging teachers, he had a student helping out with that. Writing letters to teachers across the city letting them know there was this resource for them so I’ve got big shoes to fill. REBECCA VALLAS: So Charles as you’re telling that story of Xeroxing at 4 AM because that’s what the students needing. His experience is far from rare. You yourself were actually a teacher in Oklahoma actually one of the states now with an active strike going on, tell me a little bit about your experience in the classroom as a teacher in Oklahoma and what you went through in trying to make sure your students had what they needed in the classroom. KATIE VALLAS: I’ll say too, when I share my story, my story is far from unique here, I’m staying really closely tuned to all of the work of my former colleagues who now are continuing to [INAUDIBLE] students and who are continuing to be marching and fighting right now for everything that their students need. So my experience was I was a brand new teacher, fresh out of college in Tulsa, Oklahoma and I walked into my classroom on the very first day, really excited for teaching American history, and in my classroom there were desks and there was a chalkboard and that was it. There wasn’t anything else. So I had to start thinking OK wait, what does a lesson look like if I don’t have pencils and what does a lesson look like if I only have some textbooks that we dug out of a back closet that were pretty fundamentally outdated and what does a lesson look like if I don’t have technology. And from there we started building a classroom from scratch, and by we I mean I was paying a fair amount out of my own less than generous salary but I also was relying really heavily on friends and on family to help out. So I posted my first Donors Choose project my second week of teaching for binders because a lot of my students didn’t have notebooks or binders I learned. And so we needed to have some way for them to keep everything organized and that was something that actually my fair sister helped donate to and make possible. So from day one the story of my classroom was a story of being underesourced. REBECCA VALLAS: As you mentioned your experience is far from unique. It’s actually the norm in so many classrooms across the United States. And in many ways, the projects, the requests that are on the DonorsChoose.org site really paint a picture of what’s going on in classrooms across the country, really reflecting how much unmet need that is out there when it comes to basics like pencils and current textbooks that don’t have George W. Bush as the president listed in them. Tell a few examples of some of the projects that are currently on the Donors Choose site. KATIE VALLAS: So if you browse through what you’re going to see is you’re going to see a selection of exactly, the basics. So there is a teacher right now who is in Bakersfield, California or another teacher who is in a small town in Georgia who are both looking for microscopes. So their science teachers, they need microscopes for students to be able to choose the science that they need to do, but then you also will see teachers who are thinking really deeply and dreaming really big. So you’ll also see teachers who are in New York City, teachers who really want to bring students to be actually able to absorb some of the culture that the city has to offer, so taking students on field trips to museums or taking students to be able to see a symphony or what you’ll also see is teachers using our site for professional development. So in my own former district in Tulsa, Oklahoma you’ll see teachers who are requesting the ability to be able to go to get national board certification so that they can actually be pushing themselves as educators or be able to go to conferences where they can learn new tactics to be able to bring into their work. So really it’s everything from the basic fundamentals of do students have what they need to be able to do a lesson in your classroom all the way through really creative and ambitious things that teachers are always thinking about for their work. REBECCA VALLAS: And a lot of folks may have reacted to the good news, $29 million, all the projects being funded by saying wow that’s great I guess we can move on and support a different cause. But the day after this gift, 16,000 more requests if I’m getting that number right came into the site. KATIE VALLAS: That’s exactly right. So right now on our site we have over 20,000 projects renewed and it was the day after as you said. And the reason for that is that the issue, if education funding were an issue of $29 million people would have solved it a while back. This is an ongoing need and it’s something that’s always there. REBECCA VALLAS: Where can folks go to learn more about Donors Choose and how can they find out more about the types of needs that are in the classroom? KATIE VALLAS: So if you go to DonorsChoose.org which, if you just go to our basic website, go to our homepage you’re going to be able to immediately see there are some requests so I would urge you to go to the search bar at the top and search for your city, search for your town, or search for something that really spoke to you when you were in school, maybe a book that you loved a subject that was your favorite or a play that you always wondered if people were going to be doing a few years later and see if there is a classroom that is doing exactly that. And then if you’re interested in learning more too just about our impact over the last 18 years you can go to DonorsChoose.org/impact and see a little bit more of our story there. REBECCA VALLAS: Do you have any favorite projects or requests that are on the site currently that you’re really hoping if someone is listening maybe they’ll find it and fund it? KATIE VALLAS: So many that I started making a list and then I realized this was ridiculous. I think the thing about our site is there are projects that really speaks to anyone, speaks to everyone. What I would really say is go in and type in the thing that you’re passionate about and you’re going to see teachers doing exactly that. REBECCA VALLAS: I’ve been speaking with Katie Vallas, the school and partnership engagement manager at DonorsChoose.org also a former Oklahoma teacher and my beloved sister. Kat I think we can scratch one thing off our bucket list by having had you on Off Kilter but I feel like next up we have to figure out how to be the joggers who find the body in Central Park on “Law and Order” any ideas how we finally do that? REBECCA VALLAS: And that’s all the time we have. And that does it for this week’s episode of Off Kilter, powered by the Center for American Progress Action Fund. I’m your host, Rebecca Vallas, the show is produced each week by Will Urquhart. Find us on Facebook and Twitter @offkiltershow and you can find us on the airwaves on the Progressive Voices Network and the WeAct Radio Network or anytime as a podcast on iTunes. See you next week.